I backpacked for the first time in 2006 and am now hooked. I have hiked most of my life in the South on flat land or small hills. I have hiked mostly on the east coast, doing weekend trips in the Appalachian Mountains. Since moving to Arizona, my hikes have ranged from short desert hikes to overnight backpacking trips throughout the state. I am working towards lightening the load and currently use a solo non-free standing tent, canister stove, and purification tabs to cut down on weight. Most of my hikes are solo and range from an overnight trip to 4-5 nights on the trail. Length - Shoulder Seam to Hem: 25.5"
This performance long sleeve features a versatile V-neck, for almost any wearing occasion in any season. 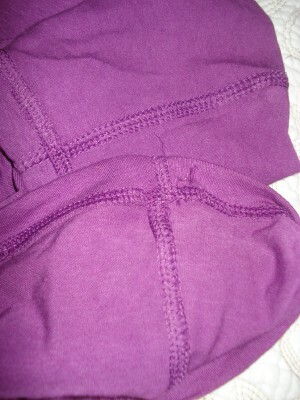 It also features flat athletic seaming and a fit that is not too loose, not too tight. flex-fiv performance fabric drapes like silk and feels like cashmere, making you feel as though you're wearing nothing at all. flex-fiv performance fabric knit structure allows maximum air-flow and temperature regulation with minimum weight. flex-fiv performance fabric naturally protects you from the sun's harmful rays and retains little heat. flex-fiv performance fabric naturally remains odor free. 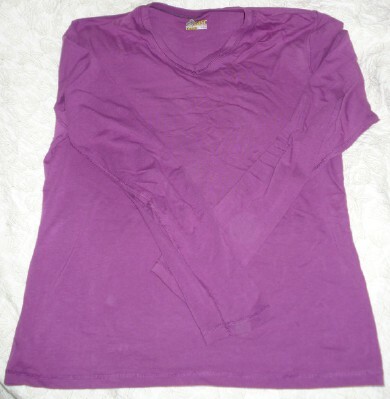 I am testing this shirt in the Purple Sunset color. The shirt itself is more of a pinkish purple than the pictures show. The fabric feels very soft and silky. This top also has flat seams to prevent chafing. As a taller than average women, I love the fit of this shirt! The sleeves are long enough that I don't feel like I am wearing a shirt that shrunk in the dryer. The fit is somewhere between a snug sports fit and a relaxed, looser fit. Its tight enough for sports without clinging to every part of the body. I think that it runs on the large side, so someone between sizes could possibly go down to the smaller size. Also the V-neck is flattering withing being too low. 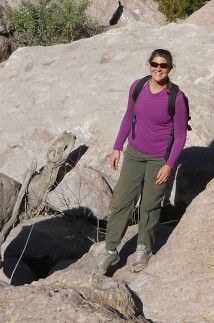 I have worn this top on a desert 10.5 mile (16.9 km) hike. The temperatures ranged from about 55-65 F (12.7-18.3 C) and there was a wind of 5-10 mph (8-16 kmph) with mostly sunny skies. I wore a sleeveless sports top under this shirt and was warm enough as long as I was moving or in the sun out of the wind during breaks. My back did sweat from wearing a pack, but this shirt did a great job of wicking the moisture away and drying quickly when I took the pack off during breaks. I was hiking in desert country, so I was often brushing up against Cat-Claw (a thorny shrub) and other prickly bushes. At the end of the hike I inspected the top for snags and was happy that there were none even though I had a few in my pants. Even though the fabric is light and silky, it does seem to be durable. I did notice that the shirt wrinkles pretty badly if it's left in the dryer after the cycle in done. So far that is the only downside that I've noticed, and that's very minor one. So far I really like this top and look forward to trying it out on may more hikes and backpacking trips over the next few months. This top has been worn all over Arizona, from as far south as Tucson to as far north as Page. Conditions have ranged from sunny and warm in the mid 80s (~ 30 C) to windy and cool (40 F, 4 C). The trails have ranged from well established trails to bushwhacking up the side of a mountain with many thorny bushes and cacti to navigate through. The elevations have ranged from 1,100' to over 7,000' (335 m to over 2134 m). Conditions have always been dry as it does not rain often in Arizona. 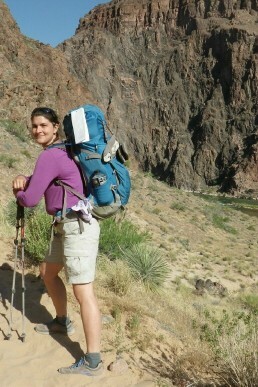 The top has been worn for a 2-day backpacking trip, 5 days of technical canyoneering, and 3 full day hikes. In addition to a 2 day backpacking trip, I have worn the top day hiking, technical and non-technical canyoneering, and rock climbing. Since I have been doing as much off trail hiking as I have been doing on-trail hiking, this shirt has been in contact with the numerous types of thorny bushes and cacti Arizona has to offer on almost every trip. Small hole in the on the back of the right shoulder. 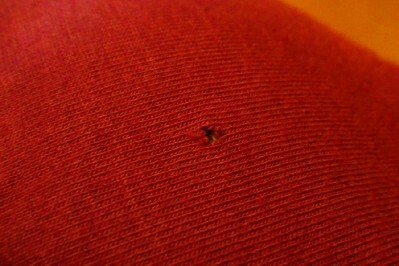 I have only found one small snag and noticed a small hole in the shoulder area. Considering that this shirt has logged well over 50 miles (81 km) throughout the Arizona desert and mountains, with many of those being off-trail, I think that this is very minimal wear. I am also happy that the hole has not started to fray or run. Seam wear on the sleeves. The seam threads have started to pill a bit and become fuzzy looking. However, this does not interfere with the performance of the top. The seams do not look like they are coming loose, but it looks like the type of threat used is prone to pilling. I normally wear this top over a tank top base layer and under a fleece jacket if the weather is cool. I find this top to be light enough that I don't mind wearing it over the tank top for sun protection on warm days. It also wicks well and breathes wonderfully, which is good on strenuous hikes when I am hot, but don't feel like stopping to take the shirt off. No matter how much of a sweat I work up hiking up the side of a mountain, this shirt itself does not seem to smell. I have not found it to retain any unpleasant odor after washing. I just wash the top in cool water on the normal cycle with all natural biodegradable detergent and vinegar and either air dry it outside or in a dryer on low heat. So far, I have not noticed any fading of the color or warping of the shape. It has not shrunk despite being washed and dried multiple times. I love the feel of the top as it is very soft and silky next to the skin. Additionally, it has great stretch. This has been important as most of my hikes lately have involved bouldering and down climbing. I never feel like my movement is constricted by the top. 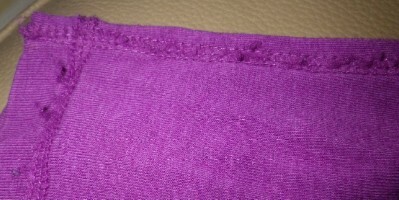 While the top is made of a knit fabric, I have not noticed much pilling of the fabric. There are no signs of wear from the backpack hip belt or the harness I use for climbing and rappelling. This shirt has performed amazingly well to date. It is my go-to shirt for all outdoor actives. The top has retained its shape and fit and has not shrunk. I have been impressed with the top's ability to hold up to Arizona thorny bushes while hiking and trail blazing. I look forward to seeing how the top does over the next few months. This concludes my Field Report. Please check back in roughly two months for my Long Term Report. I just finished a three-day two-night backpacking trip in the Grand Canyon and used it morning and evening all three days. In addition to this backpacking trip, I have taken this top on three day-long hikes and two day long technical canyoneering trips since the field report in March.The elevation has ranged from about 1,100' (350 m) to over 7,000' (2134 m). Temperatures have ranged from about 40 F (4.4 C) to over 100 F (37.8 C). Most of the hiking was in desert climate with low humidity and it did not rain during any of my outdoor adventures. In total, I have used this top for at least 20 days during the test period. Overall I am quite happy with the performance of this top. While it does have several small holes from encounters with all the thorny cacti and shrub brush in the area, the top has held up well. The seams are all still intact despite being stretched in every direction while climbing over boulders and doing technical rock climbing. I have washed this top at least 15 times during the test period and mostly allowed it to air dry or else used an electric dryer on a low heat setting. I have not noticed a change in the color, fit, or shape. The shirt is still as silky and soft as it was the first time I wore it. There is very minimal piling despite being worn with a backpack and/or climbing harnesses on all trips. This top does a pretty good job of breathing, but the back of the shirt still ended up soaked with sweat wherever my backpack touched my back. However, once my backpack was removed, it would dry quickly thanks in part to the desert climate. I love this top and it will stay in my regular rotation of outdoor adventure clothes. * Still fits well after 5 months of almost weekly washing and wearing. Thank you thriv NP, inc. and BackpackGearTest.org for the opportunity to test the Performance V Long Sleeve.